“Colonial India”. Also, a tribute to Irene Joshi, an accomplished colleague and South Asia specialist. Three important South Asia cartographic resources now accessible online. Also, a synopsis of the life and work of Sir William Wilson Hunter, an enthusiastic historian, author, and editor of the Imperial Gazetteer of India. Highlights—with links to CRL's catalog—of important South Asia collections in print, microfilm, and electronic form. A grant to the Center for South Asia Libraries from the British Library’s Endangered Archives Programme will support preservation of rare and fragile Indian journals. An online survey tool developed by the Council on American Overseas Research Centers for collecting data on libraries and collections in South Asia. Some highlights of recently acquired source materials on Colonial India. 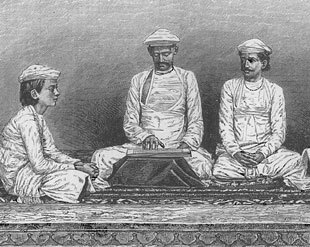 Brahmins of Bengal, from The Great Indian Religions, published by Ward, Lock, Bowden and Co., London, 1892.